Great BIG Canvas Poster Print entitled Dante and Virgil beset by demons by greatBIGcanvas at UtopyaCon. MPN: 1040623_13_48x38_none. Hurry! Limited time offer. Offer valid only while supplies last. 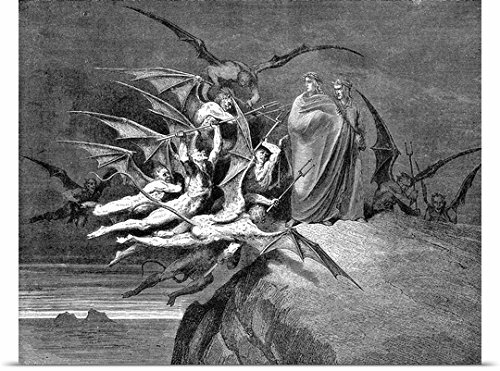 Poster Print entitled 'Dante and Virgil beset by demons'. Multiple sizes available. Primary colors within this image include: Black, Gray, White. Poster Print entitled 'Dante and Virgil beset by demons'. Multiple sizes available. Primary colors within this image include: Black, Gray, White. Made in USA. Satisfaction guaranteed. Archival-quality UV-resistant inks. Printed on high quality gloss finish paper with archival quality inks. Looks great in dorm rooms, kid rooms, offices, and more.